NOTE: You are purchasing a standalone product; MyArtsLab does not come packaged with this content. If you would like to purchase both the physical text and MyArtsLab, search for ISBN-10: 0134127129 / ISBN-13: 9780134127125. That package includes ISBN-10: 0133877701 / ISBN-13: 9780133877700 and ISBN-10: 0133976017 / ISBN-13: 9780133976014. 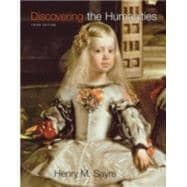 Throughout Discovering the Humanities, Third Edition, author Henry Sayre employs a storytelling approach that helps students see context and make connections across the humanities. Believing that people learn best by remembering stories rather than memorizing facts, Sayre weaves a compelling narrative of multifaceted cultural experiences that will resonate with students — throughout the course and beyond. By showing how cultures influence one another, and how ideas are exchanged and evolve over time, Discovering the Humanities helps students understand the cultural interplay that has shaped human thinking and creativity throughout our history. MyArtsLab for the Introduction to Humanities course extends learning online, engaging students and improving results. Media resources with assignments bring concepts to life, and offer students opportunities to practice applying what they’ve learned. And the Writing Space helps educators develop and assess concept mastery and critical thinking through writing, quickly and easily. Please note: this version of MyArtsLab does not include an eText. Discovering the Humanities, Third Edition is also available via REVEL™, an immersive learning experience designed for the way today's students read, think, and learn. Henry M. Sayre is Distinguished Professor of Art History at Oregon State University-Cascades Campus in Bend, Oregon. He earned his Ph.D. in American Literature from the University of Washington. He is producer and creator of the 10-part television series, A World of Art: Works in Progress, aired on PBS in the fall of 1997; and author of seven books, including A World of Art, T he Visual Text of William Carlos Williams, The Object of Performance: The American Avante-Garde since 1970; and an art history book for children, Cave Paintings to Picasso.